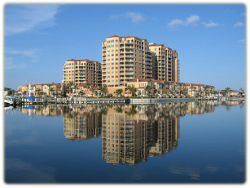 With eager buyers lining up for two weeks even before sales opened in 2002, the 200-home Belle Harbor luxury condominium community sold out in days, speaking volumes about the reputation JMC has earned. Belle Harbor's sellout was surely boosted by its high-demand design and location in the heart of Clearwater Beach's Renaissance district, with two stately towers that overlook both the animated harbor and the soothing waters of the gulf. In addtion, Belle Harbor features 15 Marina townhomes nestled next to community boat slips and 23 city townhomes with private two-car garages.